Judging by this painter's canvas it might seem the picture is an abstraction. From my position, he seemed to be portraying a totally different scene. Considering the brush, this was merely the background, the first strokes on his sketch. It is hard for me to tell whether this is going to be an exact reproduction of the bar's terrace or a free approach although on the left side, next to his shoulder we can clearly see two or three well outlined heads. Maybe someone among you is more familiar with painting and could talk about this part of the process. As to my image. I don't like to play too much with the color on black and white effect but I wanted to highlight the notion of a new reality created out nothing, from pure black and white into a striking colorful canvas: abstract or realistic. The image tells a wonderful story. i like the artistry of this picture...your eyes would really focus on the painting and the painter. And from what I can see of the artist's work, I think I would like it very much! Very well shot photo! You've nicely highlighted the subject! I love the treatment you gave to this superb photo! All I noticed the very first was the canvas!! You never can tell what an artist might see when he is working. The cutout effect works well here. Wonderful shot! But I liked the painter's picture too! What a beautiful reminder, to see life through the eyes of a painter whenever possible - something surely needed here in Athens - thank you for that. A wonderful weekend to you. A few months ago I took a break and started painting again. I was amazed in which way I could free my mind while starting to paint what my eyes where seeing in the beautiful landscape of the Dordogne (France) and how my painting was drifting from reality to that what my imagination was bringing to the surface. 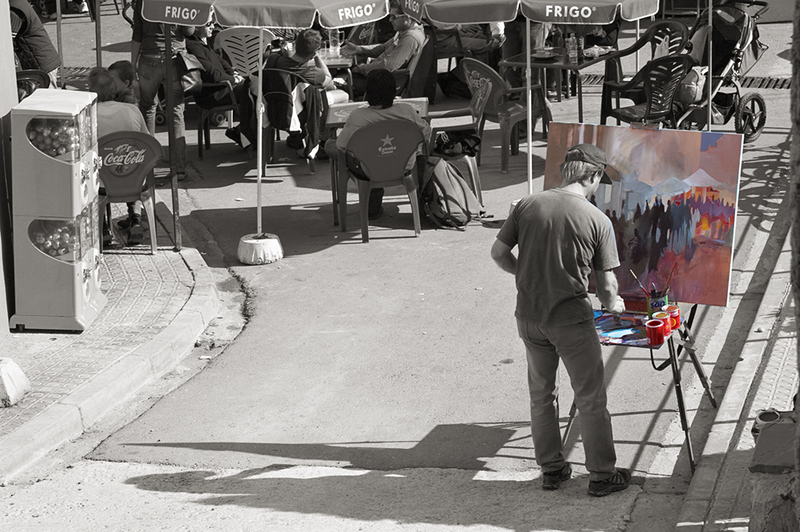 It´s that what makes a good painting to me ... changing the reality and making your paint your own, LOL. Artsy twist on the photo with the artist's painting coming to life! This is marvelous, Carlos! One of my favorites for awhile. I'd love to see this shot huge and hanging in a gallery.